Today was No Pants 2009. 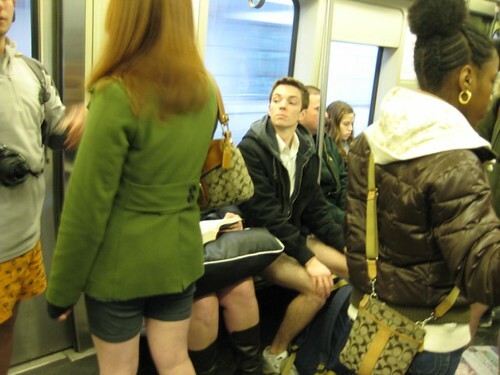 As you can imagine, no one was wearing pants; just underwear and everything else one would normally wear in New England when its 20 degreees outside. Luckily for us we spent most of out pantsless time inside and underground. We all arrived at Alewife Station by 3:00pm today, Saturday, January 10th, and formed a large crowd on the subway platform. After dividing into groups of approximately 20, the group leaders (I was one of them) gave our team assignments of when to de-pants. The plan was to get on at Alewife on the Red Line and turn around and come back once we got to Park Street. At each stop along the way, about three from each group of 20 took their pants off and got off the subway car. They waited for the next train to come and got on that one in the same spot they got off. This was to slowly increase the presence of pantsless subway riders making it seem less like a planned event, at least for the people not in the "loop". I'd say this went very successful. I took tons of hilarious pictures and a few nice videos. After the event, a bunch of the 21+ attendees grouped up and went to Johnny D's restaurant/bar, still wearing no pants and were treated to free appetizers and enjoyed a great time of no-pants dancing. And now what you really wanted: the pictures and video clips!